Marijuana dispensaries not making enough ‘revenue’? 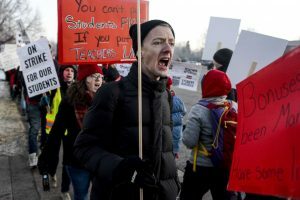 Thousands of public school teachers in Denver walked off their jobs on Monday and formed picket lines for the first time in 25 years to demand higher wages and stem the tide of educators they say are going to neighboring school districts to boost their pay. “Certainly at our high schools, we have students that are very engaged, very active in expressing their opinions,” Susana Cordova, superintendent of the Denver Public School District, said at a mid-morning news conference.